Quilt Story: Megan was sliced! I know you are not going to believe it, Megan was sliced from the Moda bake shop Sliced competition today! Her apron is outstanding. I wouldn't have sliced her, either! That really, really surprises me! Too bad, Megan! I was rooting for you! 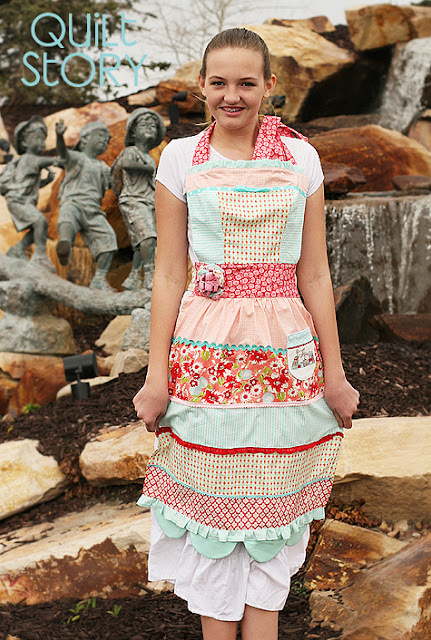 I honestly thought Megan's apron was the best - it was so creative and it had such great features!! I thought all her projects were great - it was so fun to follow along with the competition!! Me too!!! It is such a beautiful apron and so creative and practical! Oh I can't believe that. I was sure you are going to win. I'm sorry Megan! I loved mostly your designs! I also thought Megan's apron was the best. When I saw them before the Slice, I thought she'd have to win. Such a creative apron! I love it. I thought she was robbed too! That was BY FAR my fave apron. I thought she had it hands down. It is truly a fabulous apron!! So sorry! I thought you were the best for sure! Any chance of a tutorial for the pincushion?? So cute! She did well. The courage to enter is it's own prize. And there are some good prizes coming her way as I understand. Love your apron Megan. It is my favorite! i was surprised she was sliced also. she did great though and i loved all of her entries. i thought her pincushion was so adorable! That was shocking, when I read the comments one of the other aprons had been taken from someone else's design and tweaked slightly, plus something else they had made too. This idea seemed more unique than the others!!! Well I am glad I wasn't a judge because they were all beautiful projects and it was a hard decision I am sure. Be proud of yourself- you have major thread cred, girl! I can't imagine anyone had a cuter pattern than that one! Very sad. I thought hers was the best. Everyone has a different style and different taste! I thought everyone did well! To say she was ripped off implies the other contestants did not do well, which they did! Only the judges know the reasoning behind their decision and I think you should respect that and lose gracefully.